Are you searching for the best bed frames for a heavy person? We all know that choosing bed frames for larger builds can be a challenging task. To help you choose the right product, our experienced team have been testing and reviewing the very best bed frames for higher body weights. We understand that searching for a bed frame can be difficult, especially if you have a high body weight. 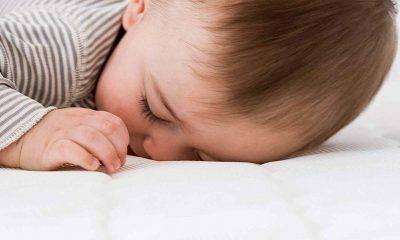 That’s why our experts here at Sleep Reports have been scouring the entirety of the market to find the very best heavy duty beds out there. 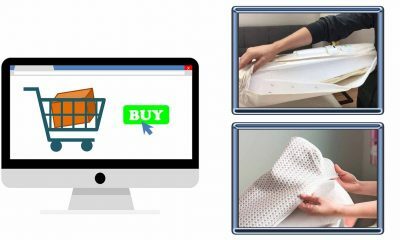 In this article, you will find reviews of our top-rated bed frames along with a handy buyer’s guide to take the mystery out of bed shopping. So, read on for everything you need to know about extra strong bed frames. Here are the latest reviews of the 3 best bed frames for heavy people. 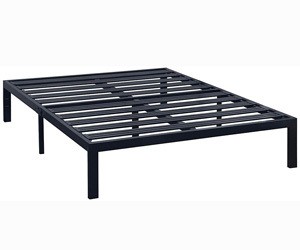 The Zinus 14 inch Smartbase Mattress foundation is our absolute favourite bed frame for an overweight person or for those with larger body types. This innovative frame can be easily folded, so it is extremely easy to ship and move from place to place. Incredibly, this frame has a weight limit of 2400 lbs, making it a suitable choice for an obese couple or individuals with very high body weights. 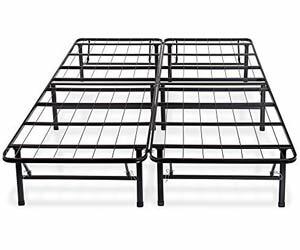 Part of what makes this pretty much the sturdiest bed frame out there is the steel frame, which is durable and hard-wearing. The arrangements of the slats mean you can rest assured that the entire mattress is supported. 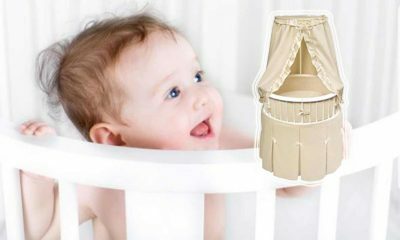 Therefore, this helps to prolong the life of your mattress and prevents sagging. We love the Zinus Smartbase and think it’s a great bed for big people. Let’s take a look at the key product features in more detail. Quiet bed frame: With many metal bed frames, a common grumble is that they can make all sorts of squeaks and noises when you move around. Not so with the Zinus Smartbase. The way this mattress is constructed means that you can get a quiet night’s sleep no matter how much you move around during the night. This will be good news indeed for those with very restless or fidgety partners. 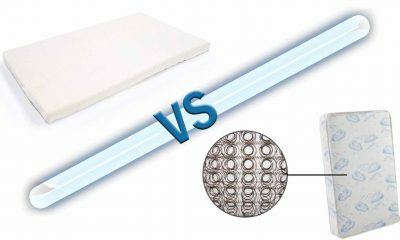 Suitable for all mattress types: No matter what type of mattress you currently sleep on, you can continue to use it with the Zinus Smartbase. This means that you won’t need to shell out on a new bed frame if you decide to switch mattress types during the next few years. Therefore, we can recommend this bed frame whatever your mattress preference. Foldable design: This mattress is specially designed to fold easily. Not only does this make it easier to ship in a smaller container, but it also makes it simple to move around. You could even store it away if you don’t need to use it for an extended period of time. As many heavy duty mattress frames are extremely heavy and difficult to move, this is a big bonus. 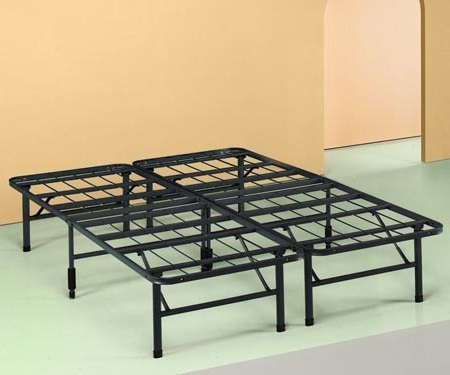 This is yet another of the best heavy duty metal bed frames currently available on the market. Once again, it’s from leading brand Zinus. Although with a lower weight capacity than the previous model, this durable bed frame can still support an impressive 1,200 lbs of body weight. At under $150, this allows you to purchase a really high-quality product at a very affordable price. This bed frame is also foldable, making it highly portable. With great under-bed storage space and a supportive slatted design, it’s not hard to see why our experts were so impressed with this strong bed frame. It’s a great choice for those looking for a strong queen bed frame. So, why do we love this bed so much? Read on for a more detailed run-down of the product specs. Supportive slatted design: The slats on this bed frame provide a great level of support to your mattress. 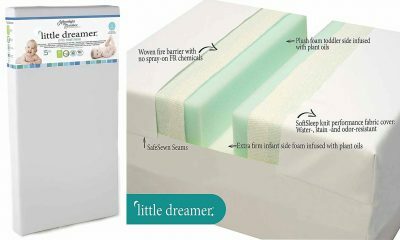 Therefore, this prevents sagging and unnecessary wear and tear on your mattress while you sleep. 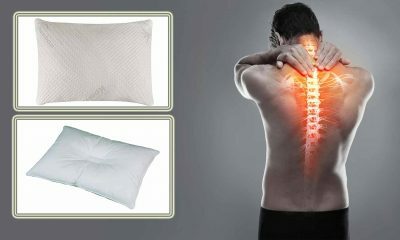 This is great for providing your body with the support it needs and also prolongs the life of your mattress. Therefore, you will not need to buy a heavy duty box spring in addition. 13 inches of under-bed storage: Unlike many other models, this 14-inch bed frame boasts an impressive 13 inches of under-bed storage space. If, like many of us, you’re short on places to store your belongings then this can be a real god-send. Therefore, you can make your bed work double-time as a comfy place to sleep and a place to tuck away items you need to store. Foldable design: Because it can be so easily folded, this means that you can make the bed frame very compact if it needs to be moved. Therefore, there will be no need to take your bed apart entirely in order to fit it through a door. Also, this makes compact shipping a possibility. Here’s yet another great bed for those searching for a durable bed frame. With this bed, Classic Brands have created a product that is extremely sturdy but can be folded to be highly compact. Not only that, but the bed frame is super-affordable too. Therefore, it should be within reach for most budgets. 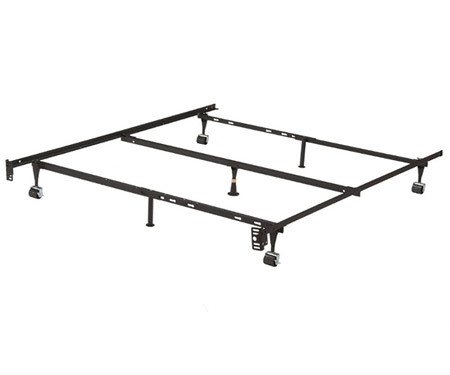 This is a very stable bed frame and can support up to 100 lbs of body weight. Also, it is incredibly easy to assemble without any tools necessary. It also boasts a whisper-quiet construction, so unlike many metal bed frames you won’t be disturbed by any untoward creaking in the night. So, what makes this bed frame so special? Read on to find out! Quiet construction: A common grumble with metal bed frames is that they can be very noisy if you move during the night. However, this is not the case with the Classic Brands Hercules bed frame. The construction means that you can move as much as you like during the night without disturbing those around you. Therefore, this makes it an especially good bed frame for heavy couples. Extremely strong and durable: This sturdy bed frame is made from extremely solid and hard-wearing Steel. 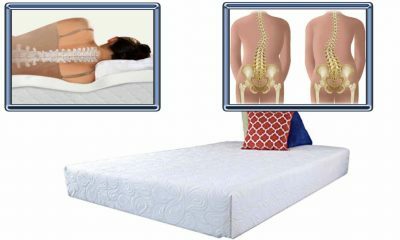 Therefore, it provides outstanding support for both you and your mattress. 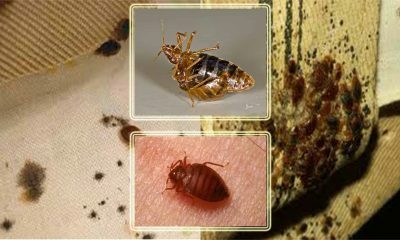 Therefore, there will be no need to shell out on an expensive box spring for your new bedding. Can be added to other bed frames: You may already have a bed frame that you like the appearance of but that cannot accommodate your body weight. However, help is at hand with the Classic Brands Hercules bed frame. This can be fitted inside frames that need extra support to make them suitable for heavier people. Therefore, this solves your problem if you have a good-looking but unsupportive bed frame. We just love the sleek and stylish design of the Best Price Mattress Model E bed frame. In fact, we think this bed frame wouldn’t look out of place in a fancy hotel and would complement most décor choices. Also, this is another budget-friendly option. It comes in a range of sizes, so is suitable even if you’re looking for a heavy duty queen bed frame or a heavy duty king size bed frame. 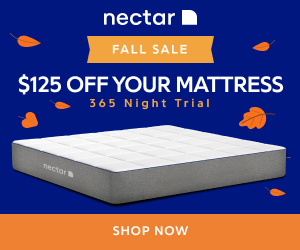 Made with heavy-duty stainless steel, the slats on this bed provide an excellent level of support to your mattress, preventing sagging or undue wear. Although not as simple as the previous options, this bed is still very easy to assemble. In fact, you can have it fully constructed in around 15 minutes. 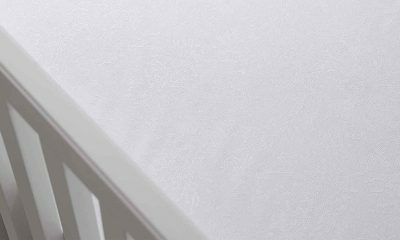 So, why do our resident experts recommend the Best Price Mattress Model E frame? Here’s our in-depth review. Great stability: Not only is this one of the sturdiest bed frames, but it has plenty of contact with the floor. Therefore, this prevents it from shifting during use. This can be a problem with many metal bed frames. 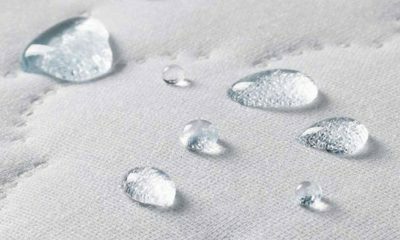 Therefore, this makes the bed safer to use and will also help to protect your floors from any scrapes. Great aesthetic: This bed has been designed with a modern and appealing look. Also, it would fit into most décor schemes without looking out of place. As many metal bed frames and strong platform beds can look pretty utilitarian, this helps this product to stand out from the crowd. Therefore, it’s a great choice for style-conscious buyers. Highly supportive: This bed frame is made from strong and stable stainless steel, including the slats. Therefore, this provides a superior level of support to your mattress. Not only does this give your body the support it needs, but it also means that your mattress is less likely to sag over time. 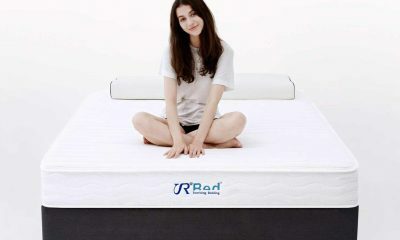 Therefore, this can help to prolong the overall life of the mattress. 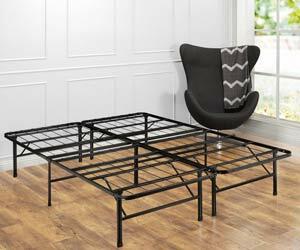 Also strongly deserving of a place in our top 8 is the Olee 18 inch bed frame. Amazingly, this bed frame can accommodate up to 2000 lbs in body weight. Therefore, it is one of the sturdiest bed frames for heavy people. The frame and slats are made entirely from strong and sturdy stainless steel. Therefore, this is also one of the most durable bed frames you can buy. Accommodating all types of mattresses, the Olee Sleep T300 should make a suitable choice for most buyers. So, is this bed frame the right choice for you? Let’s take a look at the key features in more detail. Quiet design: With many metal bed frames, unwanted creaking can prove to be a real problem. This is especially true if you tend to move around a lot during the night and it can disrupt both your sleep and that of your partner. Luckily, the Olee Sleep T300 bed frame is designed in a way which keeps it whisper-quiet, even if you toss and turn at night. Under-bed storage: This bed stands at an impressive 18-inches from the ground. Therefore, this gives you a large amount of space under the bed. So, you can use the otherwise dead space under your bed for handy storage of even large items. Also, this extra height can make it easier for some people to get in and out of bed easily. This is especially useful for those with limited mobility. 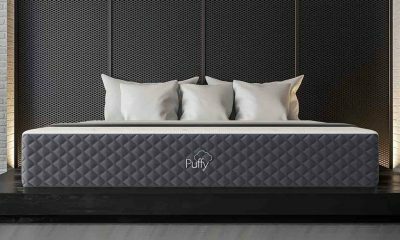 Suitable for all mattress types: Some further good news about this mattress is that it Is compatible with whatever mattress type you happen to have. 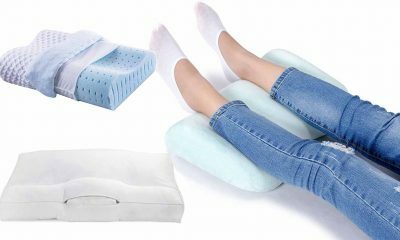 Therefore, this makes it a suitable option as a bed for heavy people whether you sleep on memory foam, a pocket sprung or any other mattress type. This is also a big positive if you decide to change your mattress type further on down the road. Here is yet another fantastic heavy duty frame which provides a great bed for big people. The convenient foldable design makes transporting and shipping the bed as compact as possible. 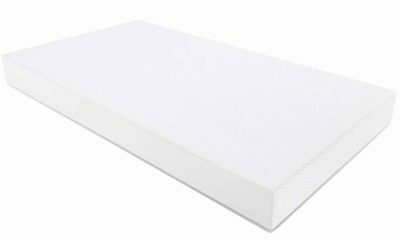 Also, unlike many heavy duty platform bed frames, this product is suitable for use with any type of mattress. Therefore, this is a great choice for most sleepers. Furthermore, with an upper weight limit of 1,300 lbs (although not the highest we’ve reviewed today) makes it highly suitable for an overweight person. 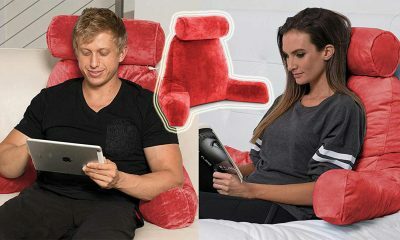 Even better, it comes in a range of colours, so you can pick one to match your bedroom décor to perfection. So, why are our experts so enamoured with the Modway Horizon Full Bed Frame? Read on to find out! Highly supportive stainless steel: This bed frame is constructed completely from extremely strong stainless steel. 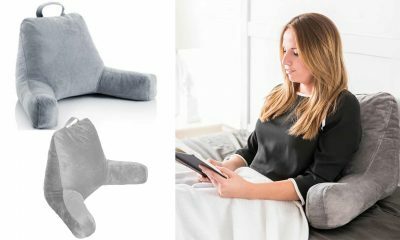 This provides fantastic support for your mattress and for your body while you sleep. Also, this removes the need for you to purchase a separate box spring base. Under-bed storage space: This mattress frame stands an impressive 14 inches from the ground. Therefore, this provides you with a decent amount of space beneath the bed. Although not the largest that we’ve reviewed, this allows you space to store reasonably large items unobtrusively beneath your bed. Foldable design: Not only is it one of the strongest bed frames, but this product also has a completely foldable design. This means that it can be folded up small for smarter shipping. Also, this makes it easier to move the bed from place to place. Furthermore, unlike most frames, you can fit this through a doorway once it’s folded without taking it apart. Finally, this also means that no tools at all are required for assembly. If you’re looking for an adjustable frame that has the ability to adapt in terms of size, this could be the bed for you. The Structures by Malouf mattress can change size between a twin right up to a queen. Therefore, if you decide to change bed size, for example If you move and have a bigger bedroom, your bed frame can simply grow to accommodate it. This is also a great option for those with hardwood floors as it has rollers which are less likely to cause dents or scrapes. This is an extremely durable frame which should last you many years. So, let’s look at the Structures by Malouf mattress in closer detail. Size adjustable: This bed frame has 5 size settings. The smallest is a twin and the largest is a queen. Therefore, the bed can adapt if your needs change over time in terms of size. It’s easy to adjust using the built-in rollers, so there shouldn’t be any issues if you need to change the size of your bed. Quick assembly: Structures say that their bed frames can be put together in under 10 minutes. While this is not as easy as simply unfolding one of the foldable models we’ve reviewed, this is still pretty quick in terms of bed frames. Also, you will not need any extra tools beyond the ones included with your product. Floor rollers: Unfortunately, many metal bed frames can damage your floors when you move them around. Naturally, this is hugely undesirable especially if you have expensive hardwood floors. Therefore, rollers are a good solution to keep your floors in tip-top condition. Also, this makes it much simpler if you need to move the frame around your room and don’t want to lift it. This heavy duty and highly durable bed frame is another great option if you’re looking for a frame that you can adjust. Like the previous model, it can be adjusted to a total of 5 sizes up to a queen. However, it’s important to note that this cannot go as large as a king size. 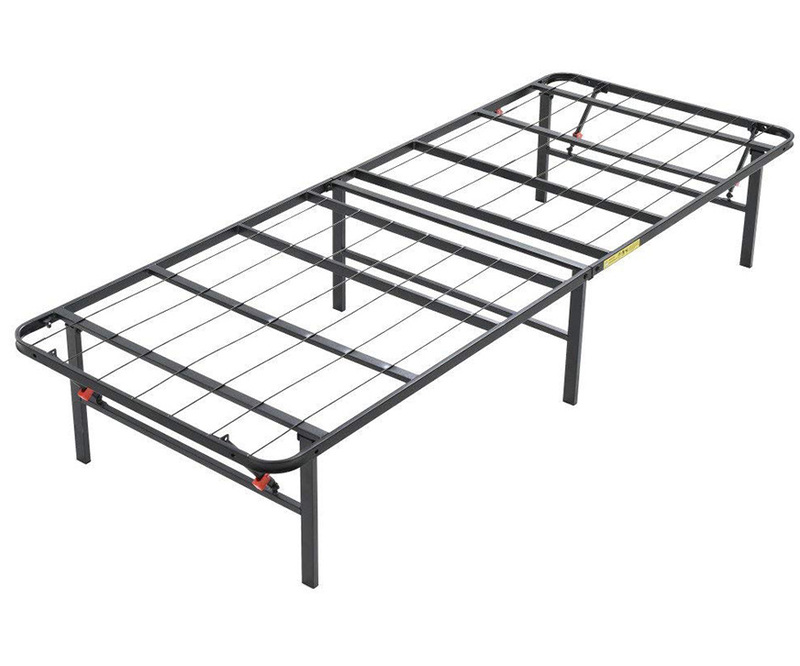 This is one of the more stable beds on our list and is especially suitable if you are looking for something with good stability. This frame provides a great level of support for both you and your mattress. Also, it is extremely strong and durable. Therefore, it should last you for many years. 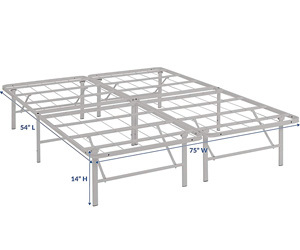 So, is the Kings Brand Furniture 7-Leg Adjustable Metal Bed Frame the right choice for you? Read on for our expert opinion. 7 leg support: This bed frame boasts an impressive total of 7 legs spread across the bed frame. Therefore, this provides extra stability to the bed while you sleep. This is especially important if you are concerned about the bed moving around and compromising your safety as you get in and out. Solid steel frame: The frame is constructed of highly strong and stable solid steel. This provides a great level of support for your mattress. Therefore, this prevents sagging of the mattress over time, which can affect the level of comfort you experience. Also, this helps to support your headboard safely in addition. Wheels for easy movement: The frame comes with wheels to make it easy to move. This means you will not need to lift the bed frame if you wish to change its location, which could be unsafe. Also, dragging a metal bed frame around can potentially cause damage, especially to hardwood floors. Wheels help to greatly reduce the risk and therefore keeps your floor in great condition. When you’re buying a bed for a heavy person, it’s important to know that what you require from a bed frame is a little different. There are particular requirements that you will need to bear in mind before you make a decision. Once you have checked for the key features of a good bed for heavy sleepers, you can be sure that the model you are selecting will be suitable for your weight and needs. Otherwise, you could end up purchasing an inadequate bed frame that will break prematurely and could eve pose a risk to you. So, what are the most important factors to take into consideration when purchasing a bed for bigger people? 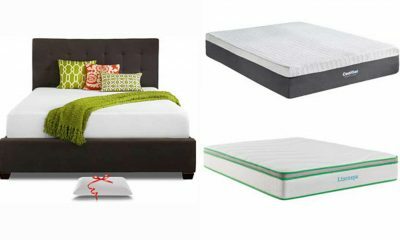 Our experts here at Matter Mattress have been busy compiling this handy buyer’s guide to ensure that you have all the necessary know-how to pick the very best bed frame for you. Probably the most important thing to be sure of is that the bed frame can accommodate your body weight. Sleeping on a frame with too low a weight capacity can cause serious damage to the frame. The worst case scenario is that the frame could even collapse and cause you or your loved ones an injury. Therefore, selecting the right weight capacity is key. In order to work out what your requirements are, you will need to know the combined body weights of anyone using the bed. If it’s just you, then this should be pretty simple. However, couples should take both sleepers into account. 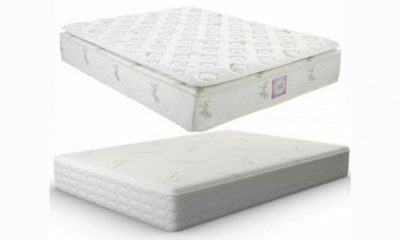 Furthermore, you will also need to include the overall weight of your mattress as the frame will need to support this as well. 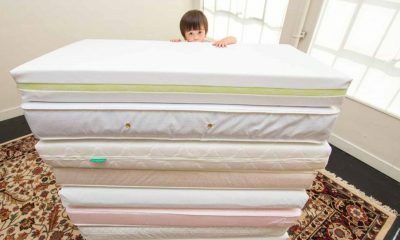 Also, find out whether the weight limit can be applied to one area of the mattress or whether it must be spread evenly. Some bed frames come with an extremely high weight limit but only if it is spread across the whole bed surface. Therefore, these are more suitable for couples where both partners are roughly even in body weight than for single people or couples with a large weight discrepancy. Many people like to use the space below their beds to store large items out of sight. This makes good sense as this is otherwise unused, ‘dead’ space. If like many of us you are short on space, any extra storage room is a big bonus. Therefore, it’s a good idea to look for a bed that is elevated as high as possible from the floor. This will give you the maximum of storage for the size of your bed. Luckily, many of the products on our review list boast and extremely impressive amount of storage space overall. Not all bed frames are compatible with all mattress types. Therefore, it’s extremely important to check that the bed frame you’re thinking of buying is suitable for your existing mattress. Also, bear in mind that you will probably need to replace your mattress before you need to replace the frame. 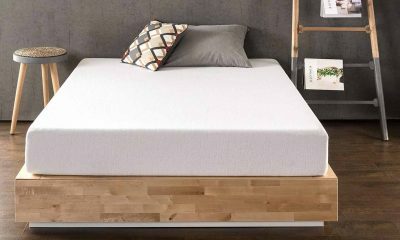 So, it’s not outside the realms of possibility that you will switch to a different mattress type during the life of your bed frame. Therefore, it’s an extremely good idea to buy a bed frame that is suitable for all types of mattress. 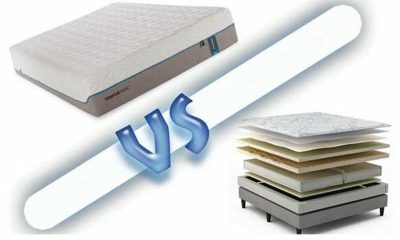 Therefore, you know that you will be able to buy any mattress you like without needing to replace the bed frame. The slats are an extremely important component of a bed for heavy people because they provide you and your mattress with support. As a rule, the more slats the bed frame has, the better the level of support they provide. Also, check the distance between the slats. Ideally, you want the slats to be as close together as possible. These two key features combined prevent gaps in the structure. Therefore, this protects your mattress from potentially sagging. So, the arrangement of your bed slats can help maintain the durability of your mattress for longer. Fiddly construction can be a real pain when it comes to bed frames. After all, no one wants to spend ages putting their bed together before they can use it. The worst case scenario is that you purchase a bed frame that you are completely unable to construct alone. Therefore, it’s a very good idea to check out how easy the bed frame is to assemble before you commit. This will also dictate how simple it is to move your bed around once it’s constructed. Possibly the easiest way to go is to buy a foldable bed frame. This has various advantages. First of all, this means that the bed fame can be shipped in compact packaging which can help to save on costs. Also, this makes the frame extremely easy to construct as generally you can just unfold it without the need for any tools. Therefore, if you want to move it you can simply fold it up and move it from place to place. This makes it possible to fit your bed through doorways without the need to completely deconstruct it. If you don’t opt for a foldable model, then it’s even more important to check out how easy it is to assemble and how long it is likely to take. Check out customer reviews to find out whether the company’s claims about assembly time are accurate. It’s also worth finding out whether the instructions are clear and easy to follow. Bear in mind that some models may require extra tools. So, you’ll want to be sure that it comes with all the necessary tools included unless you happen to have the tools you need to hand. Hopefully, you now have a clearer understanding of how to choose the very best bed frames for heavy or overweight people. Remember, your requirements for a bed will be a little different if you are over a certain weight. Therefore, it’s especially important to seek expert advice and tips before you consider making a purchase. Don’t forget to check out the experiences of real users to make sure that the manufacturers can live up to their claims. Now you’ve read our in-depth guide, you can shop with confidence knowing that you are making the right decision based on your individual needs. Sweet dreams!